Posted on 01/13/2011, 8:47 AM, by Black Cat, under Old School Wrestling Podcast, Podcast. In this marathon of an episode (hope you have 2 hours to spare) we break down SuperBrawl III, discuss Erik Watts, Maxx Payne, try to understand the history of the Big Gold Belt and much, much more. There’s a special prize at the end if you get through all two hours. Just saw this went up and I am totally stoked. I actually finished watching Superbrawl III last week – I think this may have been the first show I ever saw where the crowd booed the faces (Erik Watts…his dropkick is legen…dary). It’s never a good sign when Buff Bagwell is carrying a tag team. Can’t wait to see your take on it!! Buff really did carry that team, but they were wrestling the Blondes, so he certainly had some help in that match. Jesse and Schiavone were broadcast partners in the WWF for a short period. They did Royal Rumble and Summer Slam 1990 together, and probably more, those are just the 2 I remember. And they had that same dynamic even back then. This is nothing new. Jesse would rib Tony. And Tony would seem disturbed by it. I thought they were funny together. Tony already KNEW what Jesse was all about by now. I completely forgot about them working together in 1990 but you’re totally right. I saw Legendary, while predictable, still an enjoyable movie. Seriously. I loved that the first Superbrawl took place in ’91 so it was easy to figure out which event took place in what year. Wild Bill Irwin, aka The Goon from mid-90’s WWF. Ventura: He used a foreign object, that should be a disqualification! Schiavone: But it was on the outside of the ring, Jess. They can do what they want if they’re outside of the ring. Ventura: Oh, so he can just get a gun and shoot the guy and it’s legal because it happened outside the ring? You’re even dumber than Monsoon, Schiavone, and he’s as dumb as they come! Dre’s giggles while Black Cat was giving the NWA Title history lesson had me giggling at work. Was that the WCW SuperBrawl video game for Super Nintendo I heard there toward the end of the podcast? Was that the beginning theme of a sit-com I heard at the very end of the podcast? When it was implied that they next podcast would be football themed I figured you were referring to the early ’96 Raw Bowl 4-way tag team match that was way better than it had any right to be. I have a feeling you’re talking about a different match though, with a winner who’d share his peanuts with you. I had no idea the goon and Wild bill were the same guy. Maybe I got it wrong, but I think you said you never saw Maxx Payne again after SuperBrawl. 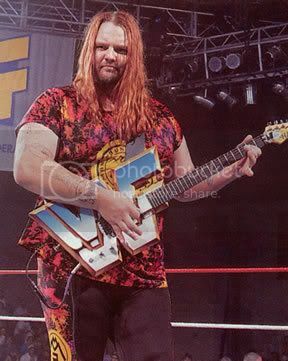 He was in the WWF as Man Mountain Rock, with a guitar that was shaped as the old block WWF logo, and was also working on a WWF documentary at some point. I think there is an outtake online somewhere. And his “finest” moment was probably when he tagged with Cactus Jack against the Nasty Boys at Spring Stampede’94 in a short brutal match. That was the first WCW PPV to be broadcast in Sweden btw. The only candidate I can think of for classic tag teams without matching outfits is the Super Powers, Nikita Koloff & Dusty Rhodes. Learning the Ropes was so bad…I couldn’t miss it each week. For the NWA and Crockett it was great publicity. I’m an admitted Barry Windham apologist. Remember when he first challenged Flair I was torn because those were my favorites at the time. Wanted to see Barry go over on Flair because I knew eventually Flair would be back on top. Benoit and Scorpio always worked a great match together. Once went to an Indy Show where the 2 fighting and the ring broke in half. Looked at each other and finished the match. Right after SB3 WCW did a house show in Detroit and got to meet Ricky Steamboat and wear the World Tag Title belt. All time thrill. Seems like a lot of people loved Barry. He had a quiet charisma that I really dug. I need to dig up the Windham/Flair classic from 86. That might be a future mini-cast. When the Midnight Express broke up after Halloween Havoc 1990 Bobby Eaton stayed in WCW while Stan Lane and Jim Cornette left the company. The 2 Cold Scorpio vs. Chris Benoit match is on the Chris Benoit DVD and Maxx Payne’s greatest match with Mick Foley vs. The Nasty Boys is on Mick Foley Greatest hits and misses DVD. Maxx Payne also sued Rockstar games creators of the Max Payne video games and they settled out of court. Like Rick Steamboat vs. Ric Flair did Sting and Vader ever have a bad match against each other? Around this time in my life every WCW ppv that came I would either buy or watch with friends, I lived wrestling and was a huge fan of Vader. But this Vader Sting match almost ruined both of those loves. I was no fool, I knew wrestling was staged, but seeing some of the inner workings come to life before my very eyes almost made me swear it off for good. At one point during this match Vader finds himself outside the ring after Sting beats him unmercifully with the strap. At that point during the match the camera cut to Vader laying outside being “attended to” by Harley Race, but what he was actually doing, and you could see this plain as day” was slicing Vaders back open so that he would bleed after the strapping that Sting had given him. What a terrible moment that was for me. This PPV was a perfect example why I was not a true WCW fan at this time. I was able to find a version of this one to watch and the only match I truly enjoyed was the Foley/Orndorf match. I was bored to tears with the rest of the matchups and that White Castle Of Fear montage killed me. The WWF had Wrestlemania 9 around the same time, and it was so so much better. It really shows how much more creative McMahon was at this time. I really connected with his story lines, and was really a diehard WWF guy. Foley is truly the man. Thank you for shining light on a truly incredible Cactus Jack match I had never seen before. It’s really fascinating to see what Foley was willing to do to become a success in the wrestling business. That’s why he is one of the greatest of all time. Also I was a fan of Tony and Jesse as commentators during 1990/91 WWF run. Tony did seem more agreessive with Jesse than usual on this PPV. « Wrestling Observer 2010 Awards Ballot~!